COVER STORY: We wrap up our Brave Wave profile with this conversation with one of the label's biggest draws: Mega Man and Shovel Knight composer Manami Matsumae. Of all the talent Brave Wave Productions has pulled into its stable of game composers both young and old, none were quite as exciting to me as Manami Matsumae. After making her entrance into game music with the classic soundtrack to the original Mega Man for NES, Matsumae played a key role in Capcom's reputation for featuring top-flight music in its 8- and 16-bit games. We met briefly in September at Tokyo Game Show to discuss her work, both new and old, as well as her relationship with Brave Wave. USG: It's great to meet you. I played the original Mega Man when it was brand new, and the music really struck me. It was very, very melodic and very… I don’t know how you’d describe the sound, the style of Famicom music. It’s almost like rock, but not quite. How would you characterize it? MM: It’s not quite rock, right? So… yeah, at the time, since the Famicom had a lot of limitations to its technology, especially in the terms of data size and the amount of sound you could use, one of the gimmicks, I guess you can call it, was repeating short phrases – you know, short but sweet – and then by repeating those, you can turn those into music that’s very easy to memorize and that’s considered very catchy and memorable. So maybe it’s not quite rock. You know what is totally rock, though? 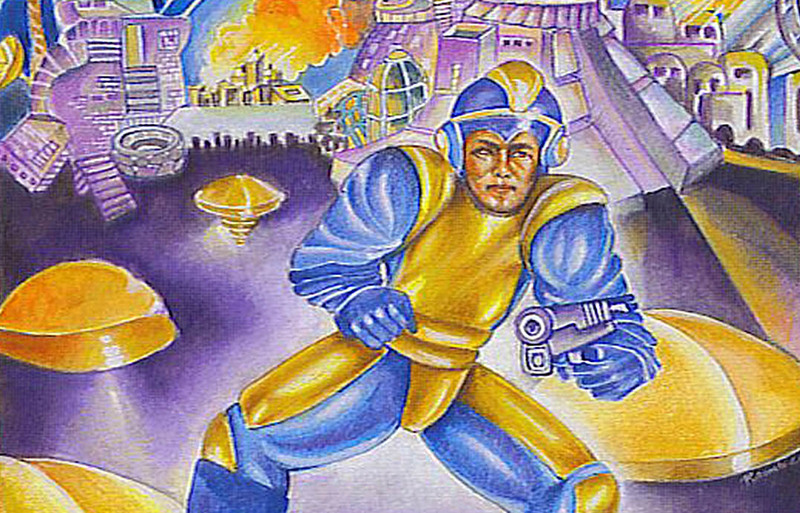 The U.S. box art for Mega Man. USG: What were your musical influences? What kind of music did you set out to create when you became a composer? MM: I mean, it’s hard to pinpoint what exactly influenced me at the time, but when I became a composer, I was listening to a lot of American music in the ’80s on the radio. I think that might have had some kind of unconscious of subconscious influence on the kind of music I make now. But to answer your second question... basically, I wanted to make music that players would think, “I’m going to listen to this music and I’m going to enjoy the game at the same time,” right? So even before they play the game, I'd want them to have that kind of excitement going into the game, if that makes sense. USG: Did you formally study music? Or was it just something that you became interested in later and entered a college music career? MM: I studied piano in university, so I wasn’t a composer at that time, when I was in the university. But yeah, I do have a formal education in music. USG: So you didn’t set out to become a composer; what was your original career plan? MM: I wanted to become a piano teacher. USG: So how did you get into creating music for video games? That wasn’t a very common occupation in the ’80s. MM: So, to become a piano teacher, you need to have students, and if you don’t have a sizable student base, then you can’t make enough money to live on. It’s hard work gathering students, and there are many piano teachers out there, so I didn’t really think there was much of a future in pursuing that particular path. When I was at university, I saw a job ad for Capcom to become a — I think it was a sound designer, right? Or I guess a composer. I applied and got the job. USG: Did you have much computer experience before that? USG: What do you think it was it about your style, your personality in your interview, that they said, “That’s okay, even if you don’t know computers, you're in?" USG: You say you weren’t a composer at the time, but did you create your own music… was it as a hobby at the time? Or were those compositions that you submitted the first recorded works you ever created? USG: So tell me about those two compositions you submitted. Do you still have recordings of them? USG: Once you were hired, did they make you learn how to do programming, or was that something that you didn’t have to worry about too much? MM: Yeah, I was asked to do the programming. From morning to late at night, I was just at it, learning. I mean, at the time, there weren’t many composers for games, so the company had no choice but to train new hires like me in learning all sorts of things. So my work was very much oriented on learning for the first part of my career. MM: You’re right, nowadays it’s a lot simpler to get the data that you want to create, and if you need to make any changes, it’s not that difficult. Back then, in order to put the musical data into the ROMs, and you had to convert the musical notes into numbers. I don’t remember what it stands for, but there was a methodology called “MML” — “Music (something) Language,” probably — and then in order to complete this process, it was quite difficult, quite time-consuming. USG: So when you wanted to test a composition, did they have to create, compile, and burn a ROM of the entire game? Or was there something that you could just listen to music on its own? MM: Yeah, there were times when you’d have to put the entire game into ROM and test it, but there are also times when only the music had to go in. Back then, the ROMs were actually rewritable? You could swap out the data and use it again, so it’s not like CDs. Translator: MML was "Music Macro Language." MM: Right, right. “Music Macro Language.” So yeah, numbers that represent musical notes. USG: Had you been much of a video game fan before working at Capcom? Or was that also something you didn’t have much experience in? MM: Dragon Quest, Super Mario. That’s it. But I loved them! USG: Those games were also remarkable for their music. I mean, Koichi Sugiyama, a pretty well-known composer, composed for Dragon Quest. So did that give you confidence, knowing that you were going into this field where other talented people had already started working? MM: Yeah, it’s funny… of course, I was happy to be joining the realm of game music with people like Sugiyama as a part of that. Now that you mention it, I actually worked with him eventually on Dragon Quest Swords. It was quite a good collaboration, so that was a big honor for me — I definitely enjoyed that! "Time of Mirror," one of Matsumae's compositions for Dragon Quest Swords. USG: What was that like, working with someone whose music had kind of an inspiration, to a degree? MM: Yeah, I thinks he was quite influential. I was very cautious, because I guess in the context of musical composition, Sugiyama is almost god-like from my perspective. I wanted to compose music that wouldn’t burden him too much. USG: Did you have to change your style to match up with his? Or was there latitude in the project? MM: Yeah, actually Sugiyama wanted me to make music the way I saw fit, so he didn’t actually put any specific direction into the project; it was more my own thing. USG: So what inspiration did you bring to that particular project? MM: Well, I'd listened to all the music Sugiyama made, and memorized it. I looked at screens of the game for Dragon Quest Swords, screenshots, and I just kind of went with that. I mention this every interview and you haven’t asked, but my composition process is to look at screens for the game, whether it’s a picture of the main character or a stage, and then I try to figure out what goes with it. So in the context of that last answer, looking at the screens was also quite vital to figuring out what kind of music went with it best. Tagged with brave wave,	cover story,	Interviews,	manami matsumae,	mega man. By the Troupple King's dorsal stem! This is sad news indeed.